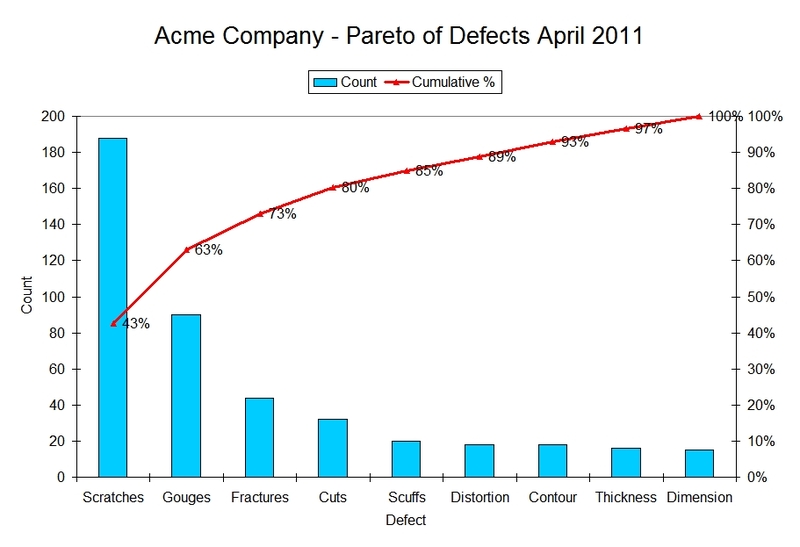 I made up a pareto of defects above. 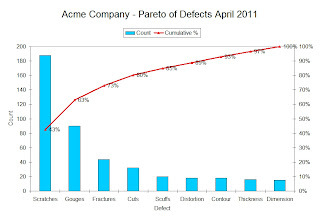 This graph counts defects for Acme company sorted by defect type. Most people easily grasp the whole sorted bar concept, but don't quite understand the cumulative line. I've seen many paretos where people just leave it off. They're probably thinking - "well, I know what my top bar is - I'll go work on that." Yeah, that's true - they know what their top bar is - but do they understand the affect improvements are going to have on their project? That's really what the percent contribution line does for you - it helps you estimate how much of that gap you are really going to close by improving the selected bar(s). For example, lets say my boss at Acme Company says "You better reduce those defects by at least 75%". I look at my defect pareto and it clearly shows me that if I just address the top bar (scratches), I'm only addressing 43% of my problem. The percent contribution line immediately shows me that in order to close the entire 75% gap I have to address the top four pareto bars (this assumes I completely get rid of that defect type). Without the percent contribution line, I might have just gone off and fixed scratches then been left scratching my head trying to figure out why my boss was yelling at me! My point here is don't forget that extra line on the pareto and don't let people tell you its not important.